With a camera, laptop, printer and Porsche, Lowe Roche created the first instant direct mail piece for Pfaff Auto, Toronto. Usually, when someone sneaks up to a rich guy’s house and drives off with a Porsche, it’s a reason to call the police. This time, it might be a reason to call an auto dealership. 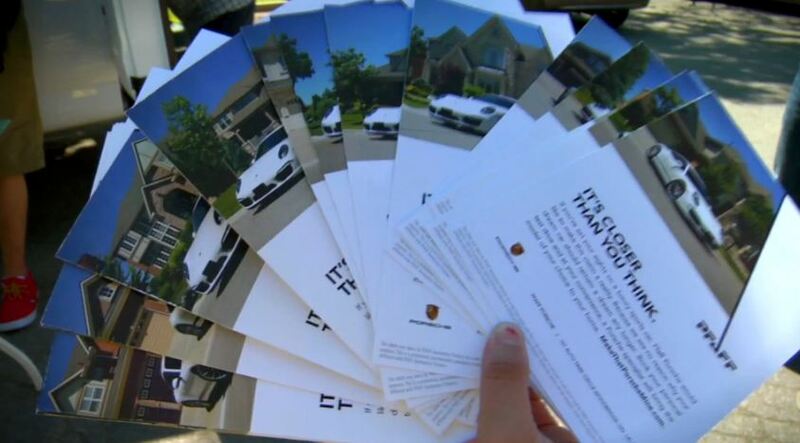 In a clever spin on direct mail for Toronto’s Pfaff Automotive, Canadian agency Lowe Roche photographed one of the dealership’s Porsches in the driveways of affluent homes, then used each image to create an ad left at the home where it was shot. The headline: “It’s closer than you think.” The result, according to the agency’s case study video below, was a 32 percent response rate to a site where recipients could schedule a test drive. Direct mail is typically about hitting as many people as possible for as low a cost as possible, but this creative idea shows that for luxury brands, a smaller effort can sometimes go a long way.